I am a very intuitive cook..The first time I attempt making something,I usually throw things together purely on instinct..Which works well, if I am making something familiar but when making dishes which I haven’t really tasted before or attempting a new cuisine ,I need to follow recipes..Though truthfully,I look at recipes more as a guideline than the absolute truth and I feel doing that gives me the artistic freedom needed to make the recipe my own. There are other perils of following recipes blindly too.Every region produces different flavour,size and quality of ingredients and it’s not possible to replicate a recipe 100% using natural locally available ingredients.That said, an onion is an onion in India,in the USA or in New Zealand.So when a recipe calls for shallots you could go to a speciality store and buy the big shallots usually called for in most foreign (non Indian) cookbooks or use the smaller Indian small onions or sambhar onions instead. Reading a recipe is also an artform-decifering what will work for your family, your area and the number of people.For example, in this recipe for Avocado and Quinoa Balsamic salad I would have never believed that raw onions (in this case shallots) in a salad dressing would transform the salad.Taking it from a staid affair to an actual extravaganza. My point being, explore new cuisines, read recipes and learn from them and make your own version of food that works for your and your family. 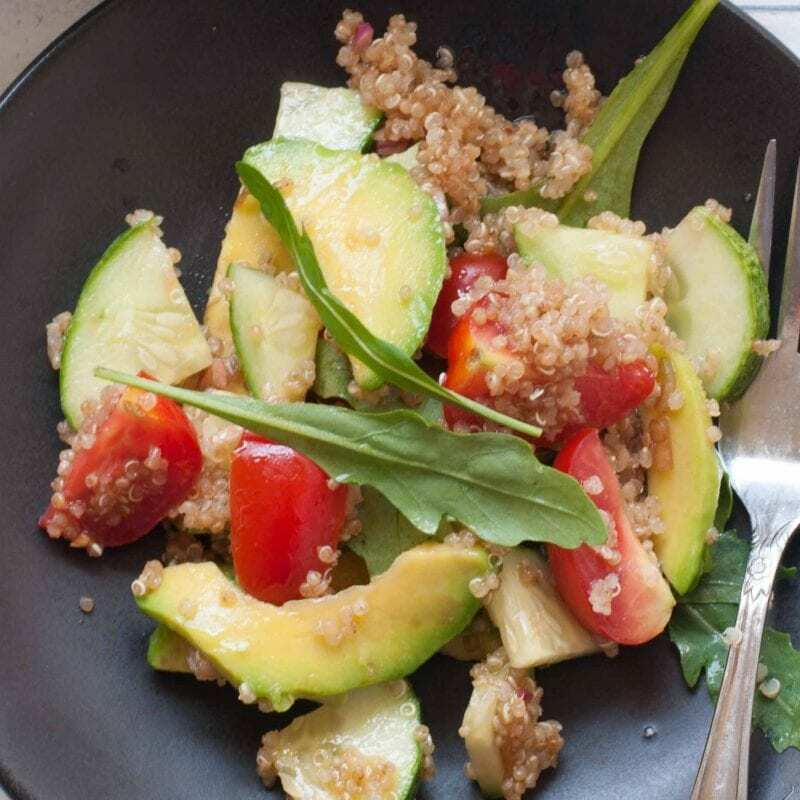 Coming to this particular salad.Avocado and quinoa balsamic salad is an all rounder vegan salad-It has no animal products-no dairy or meat, it also doesn’t have any grains.Quinoa is technically a seed and not a grain, part of the amaranth family. Quinoa is a great replacement for Wheat and rice and including variation in your diet.It is also a complete protein-has an excellent amino acids profile.It is also the least allergy causing “grain” making is a great alternative for people suffering from Gluten Allergies. Salad looks and tastes amazing if the ingredients used are high quality and fresh.Though we may prefer and want to use beautiful ingredients, it’s not always possible.The time in the refreigerator makes most salad leaves stale and wilt, but this can be rectified by soaking the salad greens in ice water for a few minutes.Doing this gives a new life to the Salad greens and makes them super vibrant. The other nifty tip is how to use avocados in salads.Usually,avocado tends to darken and look unappetising when exposed to air.To help this situation and make sure the avocados stay pretty till consumer, make sure you add them towards the last and sprinkle generous amount of lime juice on them to keep them looking fresh. Quinoa is now available quite easily online and in speciality food stores.Online stores like Healthy Buddha offer a wide range of home grown organic quinoa-red,white and the black variety.It is also available in Natures basket and Foodhall.In Bangalore its easily available in Nilgiris and Namdharis. To cook quinoa, always wash it in running water to remove the bitter coating from it.Boil it in water for about 15 minutes till the quinoa curls loosen and but there is still a bite to it. If you cant find quinoa or dont want to stock your kitchen with yet another ingredient, you can replace the quinoa with broken wheat(Dalia) or any millet at hand. Do Check out some of my other most frequented salads- Lebanese Tabouleh Salad, Summer Melon Salad with Ricotta Cheese & Quinoa Pumpkin Salad & Grilled Eggplant Salad. Healthy Quinoa Avocado Salad with Balsamic Dressing. Quinoa can be cooked in salted water for 20 minutes the tail unfurls(yes really) and it done el dente i.e. it has a bite to it.Drain cool and use. Add the salad greens, quinoa,cucumber and tomatoes in a bowl.Mix. Cut and Place the avocados just before serving.Drizzle with Balsamic dressing.The recipe is below. This dressing is by far my favourite dressing.It has simple ingredients but a highly complex taste.Each and every ingredient adds a dimension to this dressing and is essential to it.That said, if you don’t find shallots use normal onions instead. Check the salt, season again if required. Let the dressing rest for 20 minutes before using so that the onions loose the bitterness.